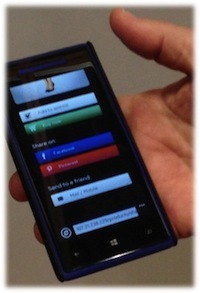 Retailer technology progress in Omni, RFID, Mobile and Platforms. A mere sliver of the crowd. 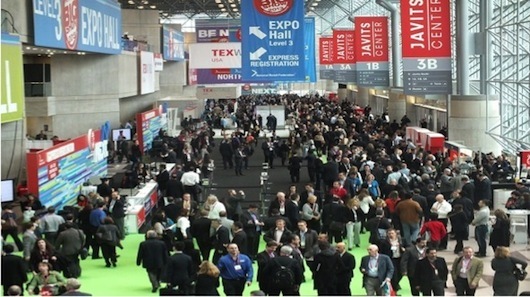 The National Retail Federation show was bigger than ever. More global, more technical, and more diverse. From ERP to RFID and Mobile, to Big Data, to Supply Chain and yes, the Store, the Store, the Store….So—let’s dive into the highlights. Click and Collect. We would expand this simplistic phraseology with Click, Pick, Pack, and Collect, although we know that won’t stick. This is really, in essence, the biggest change in what is happening in retail right now. In-store sales associates now join warehouse workers in picking and packing for customer pick-up. This approach has an impact on the traditional point of sale, since POS can now be the stockroom or web sales. It requires more effort/change of process for the on-floor as well as stockroom personnel. Click and Ship (from the store). A variation on the above, this is shipping to customers directly from in-store inventory. A chain-wide inventory locating/WMS system2 identifies where inventory is, and determines the best location from which to fulfill. Though some would like to model this directly on the warehouse process (pick, pack, ship), it is quite different.3 Floor personnel cannot be organized in an optimal picking mode, yet merchandise must be ready on time to meet pick-up appointments. Many stores allocate specialized personnel who route through the stores to pick up merchandise, either directly pulling it from the shelves or having the floor personnel ready it for them. Ship-from-store adds additional integration elements to transportation planning. Though we don’t expect the store personnel to do the routing and scheduling per se, they do participate in delivery scheduling, especially in categories like home furnishings. Large retailers, naturally, have separate home delivery and service departments, but everything should be integrated so all the customer details are visible. Often this is not the case, and retailers lack one unifying view of the process from however it is purchased to however it is fulfilled. Store Pick and Ship. Again another variation, where space is allocated in the store location as a local warehouse facility (usually in the back of the store and not entered as shelf merchandise for that store). This supports rapid/same-day delivery to customers or store-to-store transfers that might have a smaller profile/different assortments. Multi-site Fulfillment. Here the complete order for the customer is picked from multiple sites. Options for consolidating and creating one shipment or ship direct from each location are usually offered. Store-to-Store. Ordered from store, picked up at store. This can be through POS/inventory look-up and order, customer kiosk, mobile, or plain old calling between stores (happens more than we want to admit due to phantom inventory problems).4 Store-to-store transfers allow stores to focus on local markets, but not be bereft of inventory when needed. And retailers can take advantage of their established physical presence to counter ecommerce-only etailers. Direct Store Delivery. 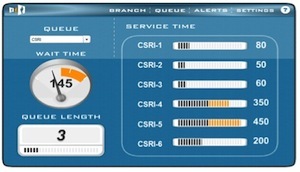 Rapid distribution networks can be responsive to each store’s needs, often in extremely tight time windows. Ecommerce. Ship to customers from factory direct, or through warehouse/fulfillment centers. Challenges still persist. Companies are still quite challenged by the process of getting their minds around Omni. Of course this is exacerbated by the use of third parties in the various processes of customer care such as delivery services,5 third-party sales,6 or wholesalers who may ship direct on behalf of the brand company. Product look-up, size locating and self-checkout from dressing room. Behavior intelligence—the concept is being able to see what is happening in the store—queuing and build-up near counters and checkout, traffic patterns—one lone shopper walking all over for an item. Firms like Brickstream help not only in that tactical moment, but also help analyze trends to better design the store. They also recommend sales staff training to enhance the customer experience and sales. How customers respond to price is critical to preserve the margin—and the sale. Firms like First Insight continue to refine their ‘initial ticket pricing’ and optimal order quantity analysis. Inventory management—never out-of-stocks, in-store inventory locating, and even size checks can now be done by RFID. Shoe sales personnel no longer need to go in the stacks leaving customers on the floor to wander away. 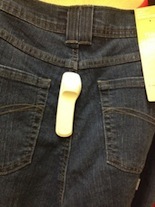 With RFID they can tell in an instant whether a size is in stock. Sales people can locate a particular size/style jean, keeping shopping and the sale in the dressing room. Firms like Tyco, Motorola and Checkpoint lead the pack on in-store applications of this type. The combination of inventory locating, instant promotions, and more effective POS results in Saving the Sale. Epicor seems to have mastered the Save the Sale programs with retailers of all sizes—from those with as many as 3000 stores to small retailers of fewer than 20 stores, proving the best-in-class programs are not just for the rich. Promotion and pricing mastery from firms like Revionics, and Epicor, who supports a variety of retail categories, continue to help retailers promote profitability. Assortment and merchandise planning—though we still have a way to go here in terms of world-class execution by many stores. Firms like JustEnough, daVinci, and JDA continue to forge ahead with rich planning and analytics. Customer behavior with appropriate staffing response, better store design, caring for customers with service and fair pricing, ease of mobile or traditional POS, and the right assortment at the right place need to be unified to extract sales yield from in-store operations. Lots of work ahead for retailers, surely. But these save the sale! NRF! There was so much there, no one could absorb it all. I eschewed my browsing and stayed ‘on track’ with our audience/customer interests. Large organizations can bring teams and fan out. I suggest this for next year, if you are planning to attend, since NRF will be the same size. To cope, NRF will be extending their hours next year and adding a full day to the conference. But attendee fatigue will still happen somewhere in the middle of day two. Exhibitors take note! For next year please stock a lot more sugar in the afternoon for all us curious, but now wearily low-sugared attendees. To those who did, thanks for the juice and chocolate. It made all the difference! You can read more about the NRF Show here.